The most exciting thing going on just now is that my sister Rosemary is twelve weeks pregnant. Today it is exactly twelve weeks which means I am allowed to tell you about it. This is what a person-to-be looks like at twelve weeks. Despite the cutesy prose, it is quite an informative site. I was rather concerned to read that Tinker's vocal chords are developing already, but then when I asked Rosie whether they had a preference for a boy or girl she said, "Well now most Cathedrals have girl choirs as well as boy choirs so it doesn't really matter." "I'm not sure about having such expectations," I said, "I mean, this child might not have a musical flare - it might even be born deaf or something." To which R responded immediately, "Oh then it would have to learn the xylophone!" Rosie having babies is something R and I have talked about all our lives and despite my own decisions, I know this is so right for her and indeed Adrian, who will make a really excellent father. Tinker (as this unborn child shall henceforth be known) will not escape a musical education, but it is that passion that'll be developed first and foremost - most children who have music lessons forced upon them have decidedly unmusical, predominantly image-conscious parents. They will also have tutelage in the visual arts, in science and sport. Adrian speaks French, German, Portugese, Italian and has a smattering of Russian. Between the two of them, Rosie and Adrian have a pretty firm general grounding in any general subject that might be of interest, so I'm sure it will receive encouragement and support in anything it wants to do, which is the greatest thing anyone can offer a child after love, which R & A have in plentiful supply. I suppose if Tinker needs to know anything about books - proper books - he or she will have to talk to his or her auntie. And if he or she needs to know about... um... how to care for fresh water fish and snails, he or she will have to talk to his or her uncle. Of course, R & A have had to come to terms with the possibility that, because of Adrian’s genetic heritage, any child they have may be born with ginger hair. Despite advances in pre-natal screening for many conditions, there is no way of knowing for sure until the child is actually born. 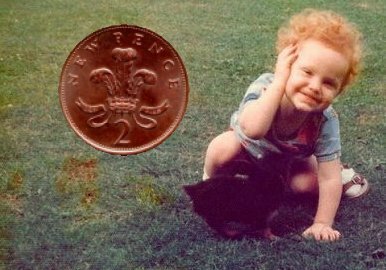 However, ginger hair needn’t be the handicap it once was. Many ginger people lead very full lives nowadays, have jobs and relationships. Adrian himself has triumphed over the stigma of being a carrot-top, copperknob or ginger nuts - something that would have turned a lesser man to drink*. Let’s just remind ourselves of what my brother-in-law looked like as a baby. Aaah! Talking of Adrian, he has a new blog, which includes everything from a story to warm the cockles of your heart to some truly breath-taking pictures of his enormous organ. If you have been affected by any of the issues raised in this blog entry, you may want to look at Red and Proud, Ginger Nation or Realm of Redheads for support and information. * I was actually really dismayed about the treatment of Charles Kennedy following his admission of alcoholism. It is an illness like any other and his denials would have been perfectly sincere because the nature of the beast is that the sufferer is very often the last to know. However, I am being generally very silly this morning as you have probably gathered. Congratulations fellow auntie-to-be! Like you, I think it's highly unlikely I'll have children (maybe adopt, who knows. Atm, I can only think of selfish reasons to have any at all - someone to look after you in your old age etc). So, I'm v.pleased my brother and sis-in-law are doing all the hard work! Hmm... must prepare them for the possibilty of gingerness (neither of them are, but my other brother is, from my grandpa). I got a knitting pattern book from the library today, which provoked many "oohs" and "aahs" so god knows what I'll be like when my nibling (nephew/niece - as in sibling) actually arrives! Anyway, pass on my congrats to R+A :-). Congrats. Being an Uncle myself of two adorable nieces (one of whom is four this very day) I know you will derive a lot of pleasure form being what ever the female equivillent of avuncular is.